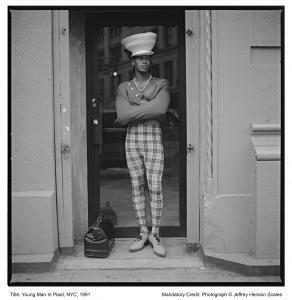 From studio portraiture to street photography, this exhibition brings together a group of geographically and historically diverse photographers whose imagery explores black masculinity as performance, as play, as invention – in particular through the adoption of a dandy-esque persona. In the early 21st century, black men are among the most influential trendsetters in fashion, music and global style culture. Yet high visibility for black men is matched by high vulnerability – as illustrated by disproportionate rates of arrest and incarceration for black men in the UK and USA. Made You Look explores dandyism as radical personal politics, a willed flamboyance that flies in the face of conventional constructions of the black masculine. It proposes that the black ‘dandy’, with his extravagant emphasis on dress foregrounds a hyper-visible identity which counters the heighted vulnerability, the result of a charged history of objectification. In the context of this exhibition, dandyism isn’t simply about sharp dressing but rather, consciously problematising ideas of male identity through dress or deportment that is arresting, provocative, louche, camp and gloriously assertive. This entry was posted in Fashion & Textile Design and tagged Exhibition, Fashion, Inspiration, Textiles, the photographers gallery, Winchester School of Art by Caitlin Hinshelwood. Bookmark the permalink.